Diego Maradona was offered the head coaching job of Argentina’s national team. Then it was reported that Maradona was going to accept the offer and continue coaching Messi and the boys under a new four year deal. Then it was reported that Argentina’s Football Federation gave the coach an ultimatum that he could only continue on coaching if he agreed to fire the majority of his coaching staff. And now a decision has finally been made regarding the legendary former footballer. Maradona is no longer the coach of Argentina and like I predicted the Hand of God man has decided to walk away from the offer or was denied the position (either way you look at it) because the AFA was unhappy with the former manager for refusing to replace his existing coaching staff. Maradona likely felt threatened by the organization for forcing the manager to change the formula and staff and, thus, Maradona wasn’t going to be granted as much leniency as his last experience as manager. And Maradona nearly transcends the sport of soccer in Argentina and the former World Cup legend is often making the papers for his outlandish statements, refusal to beckon to his squad’s board members and bigwigs, and his complete disregard to even return a call from his own homeland’s president. 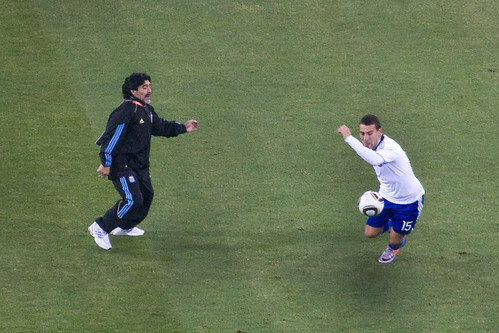 In fact Maradona might be the iconic arrogant coach that is blinded by his own past experiences as a player on the pitch. I’ve said in several blogs before that Maradona and other legendary athletes do not always make the best front office officials or manager. Often the superstar athlete relied on their sensational skill rather then tactics to be the best and transferring over to a temperamental, brain-empowering position like a head coach often can spell disaster for the man that always relied on sheer skill to be successful. And Maradona had plenty of that during his playing days and the man is still revered among the Argentine nation for his brilliant form in past World Cups. You could even say his football career was monumental considering Buenos Aires city officials are debating the erection of a statue to honor Maradona. But as a coach Maradona will likely only be remembered for his antics and not his unquestioned success.